In continuation of a video interview made earlier in July, the announcement has been made that former Detroit Consortium 6’7″ class of 2016 wing Josh Jackson will attend Justin-Siena High School in Sacramento, California where he will complete his final years of high school eligibility. In a similar video made July 10th, Jackson previously stated he would not return to Consortium for his junior season, “I will not be at Consortium. I will be out in California.” This announcement was made public prior to the July portion of AAU basketball. Now that AAU is over for Jackson and he is practicing in Las Vegas for Team USA 17u, the second half of the video was completed on 1Nation’s Team Tv Youtube account with reporter Blair Glover when Jackson finished the previously open ended sentence, “in Sacramento at Justin-Siena High School. Jackson said in the continued interview the decision for him to relocate to California was made before he led Consortium to the school’s first ever Class C basketball championship. Averaging 28 points, 15 rebounds, and six assists a game for the Cougars. Many assumed Jackson would attend the new Prolific-Prep High School when he made his intentions clear to return to his home state of California. However, Justin-Siena is not a prep school. Justin-Siena is a Lasallian Roman Catholic High School located in the Sacramento suburb of Napa. The Braves were only able to win nine of their 26 games from a year ago, and have not won a league championship since the 1998-1999 campaign. Jackson comes to Justin-Siena as the number one player in the Rivals.com class of 2016 rankings, and earned his first collegiate offers this July competing for 1Nation, as Kansas, Michigan State, and Auburn extended scholarships to the rising junior. The only glaring weakness in Jackson’s game is his size. However, Jackson used his size to his advantage against opponents. Jermaine contributed 15 points, five rebounds, and four assists in the quarterfinal gold bracket victory. He’s quick with the ball in hands, comfortable going either way, and gets into the lane whenever he pleases finding ways to finish or get to the free-throw line. Jackson is also able to facilitate the game as a true point guard, finding teammates via penetration or drive and dish. He’s developing into a knockdown shooter on the perimeter from the three-point line, with a consistent fluid release off the dribble or catch. Because he’s so low to the ground, Jackson is also a threat to guards on the defensive end with a weak handle with his quick hands and IQ for the game. At 6’6″ 220 pounds, Tillman possesses the body and strength most rising sophomores do not have. Aside from just physical attributes, Xavier has a very high IQ and motor for the game. He never took plays off throughout the weekend, rebounding at a high level on both sides of the floor, not shying away from contact against opposing forwards. He’s a consistent athletic above the rim finisher with skill and a back to the basket type game. He does a nice job of sealing his defender, allowing a easy entry pass into the post for his teammates to find him, and feeling out which to attack the basket. Tillman also runs the floor well for a big, and is an underrated passer from the post position. Several midwestern MAC schools and a few Big Ten teams were on hand to check out Xavier’s games throughout the tournament. The best pure shooter in Cincinnati was Josh Stamps of Chicago Curie High School. He has the ability to get into a rhythm from all over the three point line quickly and then the next thing you knows he’s hit two or three on you. Stamps never changed his shot in any situation, whether he was wide open, or a defender was in front of him, he’s always going to use the same lift and mechanics. He moves well without the ball coming off screens, but also can put in on the floor and create plays. He never hurried or forced the issue for Team Rose, and is a good passer for a wing. Stamps has a variety of mid-major offers from the Illinois area. Davis turned in the best performance I have seen from him this AAU circuit on Sunday vs. Nova Village in the 16u Gold Bracket Semi-final, going for 20 points and 14 rebounds. With ideal size, length, IQ, and footwork, Austin went about his game with a workman like approach, battling for every rebound, creating second-and even third opportunities for his team to score. He’s got a decent skill set down low, finishing from either side of the basket, and even with defenders draped all over him. On defense, he also blocked two shots, and rarely gives up an easy looks to opponents. Illinois was in full-staff to watch Austin on Sunday, and Davis concluded the weekend with an offer coming from Kent State immediately following the tournament. Devon is developing into a complete scoring weapon on the offensive side of the floor. He showed his versatility in the silver championship victory vs. the Michigan Playmakers. He scored on all three levels, hitting a couple threes on the wing or in the corner, slashing to the basket off the dribble, or playing in the middle against a 3-2 zone, and driving to the basket using his body to shield shot blockers. Combined with his high-motor, competitiveness, and athleticism, Devon is a 2016 prospect schools in the midwest should track during his junior season. Coaches from all across the country were at hand in the queen city to take in talent the midwest has to offer at the Adidas All In Classic. Capaldi turned in his best performance of the AAU season on Friday night. He came off the bench hitting his first four shots of the game, including two threes, to give his team early momentum which would be used to gain separation in the route win over Who Got Game. He just needed to see one go through to get into a rhythm. He put the ball on the floor and pulled up in the mid-range game, came off a screen or two in the lane, or spotted up on the perimeter for a few threes. Also a quarterback on Madison Heights Bishop Foley’s football team, Capaldi showed he can take a hit or two, converting on two and-ones in the game. He’s got quick feet in the team’s 3-2 zone, and his length at times is hard to get around for opposing ball-handlers. McCree was solid over the two pool games for 17u on the day. He came out shooting in the first game, going 3-3 from three pointers in the first half. However, he showed more of a complete game in the second game on the day, putting the ball on the floor, getting past his defender, finishing at the rim, and hitting some pull up jump shots in the lane. But Ted is more than just a scorer, he handled the ball a little bit as a point guard creating and finding teammates, getting steals and playing defense, and rebounded well in spots over the course of the day. Besides just basketball ability, his IQ and understanding for the game set him apart from most high school guards at this level. He seems to never get rattled or frustrated on the court, and keeps an even demeanor even through rough parts of a game. Carter is an athlete. He probably has the highest vertical on the team, and he isn’t even the tallest player. He used his athletic ability to rebound the ball both offensively and defensively on the day. Carter is still polishing up individual skills such as shooting and creating offense for himself, but the potential is there to be a decent prospect over the course of the next two years. Handled more of a scoring role for the Mustangs in the team’s game vs. SMAC Primetime, coming out and getting 12 of the team’s first 15 points in the game, hitting a couple threes, and contested finishes in the lane. Competes with an impressive IQ for the game, as to be expected because his dad is the coach of the team, making a few nice passes or cuts to get easy baskets. Real good shooter when playing off-the ball, especially when he gets a clean look. A bit of a tweener between a small forward and power forward, Powell proved he can do a bit of both and be effective. Powell impressed coaches in the victory vs. Ohio Elite with 17 points and hauling down seven rebounds. He’s got a nice touch from 15 feet and in that can be extended to the three point line at times, and can take his man off the face up, and get to the lane with his left hand. Good athlete, decent leaper off the floor, and length all give Powell the potential to become a promising prospect at both ends of the floor if he continues to work on polishing his game up. Here are a few players that stood out at the MHSAA Reaching Higher Showcase. Champions were crowned, and the last official day of the first live period of July concluded. Brimhall put Cache Valley on his back in the team’s opening round bracket victory vs. Michigan Playmakers, scoring 22 points, including five three-pointers. At 6’4″, Brimhall has great size for a college level two guard, he gets great lift on his jump shot, and seemingly had unlimited range on his three. He’s effective coming off ball-screens, or pulling up off the dribble. Tyler has good ball skills that allow him to aggressively attack the lane and get to the rim. He can be a teams leading scorer, serve as a facilitator, and play tough defensively, an overall good all-round player. Anderson was tough to handle in his team’s semi-final victory. The one thing Jason does when he steps out on the floor, is compete. He’s the vocal leader of a talented team that knows how to play the game. Anderson likes to get others involved on offense first, but when he decided to shoot he was deadly, hitting tough pull-ups and three pointers throughout the game. He’s IQ for the game also stood out as well, defenders can’t take plays off when he doesn’t have the ball in his hand, as he took advantage of a few back-door cut opportunities for easy baskets. Jason was also very aggressive on the defensive end of the floor. He didn’t let anybody blow past him, and is a very good athlete for his size. Alex is a stretch four forward with great length, size, and athleticism. He can do a little bit outside, but did most of his damage in the semi-final victory down low. He does a great job of carving out space down low before the entry pass, giving his man a clear target to get the ball. And when he got the ball, he did a great job of feeling his man out and taking advantage of what the defender gave him, scoring with either hand. Alex also rebounded the ball at a high-level defensively, and can get up and down the floor and create mismatches in the full-court. He currently has ten plus offers now, but more to come after at times playing this weekend in front of at least 20 coaches. An interesting occurrence happened in Howard Pulley’s semi-final game, apparently a circuit broke loose and the lights dimmed for a minute. And before the lights went out, Broman hit two or three threes. Now I don’t know if he actually “shot the lights out,” but he might’ve had something to do with it. Broman can shoot, from anywhere on the floor, he does a very good job without the ball and defenders can loose track of him sometimes. He also has some flash to his game, he can create off the dribble for himself. Bjorn can be both effective in an up tempo style of play or a half court set. Torres is huge, at 6’9″ 250 pounds, you can’t miss him when he is out on the floor. Despite his size, he moves well out on the court. He’s got some skill in him as well. He can finish around the basket with both soft and power finishes, and is effective when he gets the ball in a face up situation. Torres has a nice touch from the mid-range that at times can be stretched out to a three-pointer. He emerged as a beast at rebounding the ball, and playing quality post defense throughout the day. Pool play ended, and a few bracket play games for several age groups had started. With championship Sunday on the Horizon, the intensity of games start to increase, drawing more and more interest coming the way from college coaches. An unsigned senior who will attend Impact Basketball Prep in Las Vegas this upcoming season, Danny so far has brought an added dimension to an already quality Playmaker team. His greatest impact on the day was defense. With long arms and quick footwork, Dixon was able to block shots in close and and even shots on the perimeter, and when he wasn’t blocking shots, just his presence in the lane messed up the concentration for those thinking about shooting. Dixon also found a way to contribute on the offensive end. He showed off his touch from 8-10 feet, flashing into the lane, facing up and letting go, rebounded the ball well on both sides of the floor, and found teammates for assists in the high/low posts. His most complete game on the day was a 10 point, six rebound, and five block performance in a blowout victory. Eastern Michigan, U of D Mercy, and Arkansas Little Rock were in attendance for a few of Dixon’s performances. Gibson had a quiet yet productive day for the Playmakers. He long, athletic, and quick off the floor for a tweener small/power forward. In the team’s victory vs. St. Louis Majestic, Jalen didn’t score much, five points, but seemingly got every rebound on offensive, coming away with a total of nine rebounds in the whole game, and altering two shots. He’s got a nice touch from 10 feet and in, but is more of a garbage man when it comes to getting his points, he’s also going to have to work on not bringing the ball down when he gets a rebound, he goest from being 6’7″ to 5’7″ real quickly. If Jalen continues defensive performances like this in July, the more and more he becomes a likely scholarship player for division two schools and low division ones. In the one game against Howard Pulley, not one player stood out, the whole team did, in front of every high-major college in attendance at the Chicago Summer Jam. The Fire like to push the ball, and that works when you have 6’7″ Lanell Hill of Morgan Park High School. He’s long, athletic, and a big strider on the break, giving the Fire an easy scoring opportunity when pushing tempo. 5’5″ guard Cameron Irvin also stood out on day with his shooting in the second half. During a five minute stretch in the second half, Irvin made three pull-up three pointers that was the sign of the route that would become of Howard Pulley. 6’5″ Romello Burrell showed up as well on defense, challenging shots, and rebounding at a high level. Not too much is known about the Waverly swing man, but his game speaks for himself. He’s a shooter, and a good one to. He’s forced to play a more of a stretch four role on a team that lacks height, but Smith loves to spot up on the perimeter and shoot his southpaw j. making three 3’s in his teams opening round bracket play game, finishing with 14 points. The more he could play off screens and move without the ball, he will become a greater threat to defenses. A willing rebounder on defense, Smith also has a freakish long wing span, which he used to block a few drives to the basket. Hitting the weight room, drinking milk, and eating vegetables this Summer will help Smith become a more dominant player as opposing competition increases. 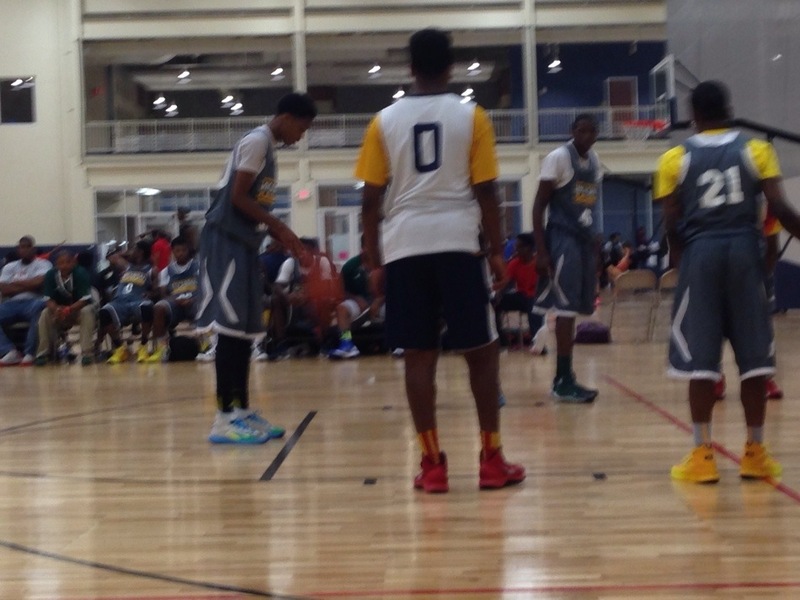 Pool play started on Friday night at the Chicago Summer Jam in Romeoville, Illinois. An NCAA certified month of July event, college coaches from as far west as Oregon, to as far East as Providence were all confirmed in attendance. Here are a few guys that stood out on day one action. Coffey by many is considered to be a top 25 prospect in the loaded 2016 national class, and did not disappoint on Friday night. Coffey obviously has all the physical tools to succeed at the next level, length, quickness, and elite athleticism, but his IQ for the game really stood out. Whenever he got the ball on the wing, he looked to pass first and get easy shots for teammates before thinking about scoring for himself, at times being too unselfish with the ball. But the kid can score also, from all three areas. He can come around screens and shoot the three, create space and separation to get into the lane off the dribble, or finish against taller defenders in the paint. On defense, his ability to play the passing lanes with his length create problems for opponents. He also had the dunk of the night, a two handed, full speed on the fast break and-one style. Coffey so far has reported offers from Minnesota, Creighton, and Miami, just a few high-major schools interested. Johnson was real fun to watch in the team’s win over Champaign Heat. Jarvis served at the catalyst for the Panthers offensive attack. He’s very athletic for a lead guard, and likes to quickly attack/advance the ball up the floor on the break, catching the opposition off-guard and setting up his teammates in positions to score. But in the half-court set, he’s very savvy with the way he likes to collapse defense. He can go with either hand, with the vision and passing ability to get guards and forwards involved. Johnson also did a fair job applying on ball-pressure to opposing guards on the night. Jarvis is a player to remember to fans in Michigan. As one of his 10+ high-major division one offers happens to be the Spartans of Michigan State. Booker is a real underrated prospect in Michigan’s 2015 class. If Booker’s month of July is as good as his Spring session, the Walled Lake Western guard will no doubt collect a few offers before the high school season begins. In the team’s resounding victory over Colorado Connect, Jerald stood out in the eyes of a few college coaches in attendance. He does a good job of taking what the defense gives him. If they come up and pressure, he’ll quickly go around them and get into the lane, if they sag off, than team’s should respect Booker’s perimeter jump shot, as he knocked down three 3’s in the game, one from well beyond NBA range. But as a complete point guard, he can get others involved around him, he got his shooters involved off the drive and dish, or make some nice entry passes to his bigs down low. His impact on the game did not just end on offense, he got steals on defense that resulted in easy run-outs, crashed the boards and kept scoring chances alive for his team, and got the ever precious 50-50 balls. With only a few schools showing interest in his recruitment thus far, Booker is a name to remember for colleges seeking an overlooked guard. Bailey is a versatile, athletic forward. A star on the football field for Walled Lake Western, Marcus has shown he can play on the hardwood. He loves contact, Bailey play fearless down low against taller defenders, he’s not afraid to go through them to the basket and get to free-throw line. But Bailey also showed he has a nice shooting touch on the perimeter, as he knocked a nice spot-up corner three. Marcus had to at least have 10 rebounds on the night, maybe more to go along with his 14 points, if football doesn’t work out for Marcus, he has the potential to land on the hardwood somewhere. It’s their last month of AAU. College interest and offers will rise for many, here are a few players to keep an eye out for this Summer. Derek Murphy: 6’4″ Warren Mott, 1Nation? After months of rumors and speculation, Detroit Consortium and 1Nation rising junior forward Josh Jackson has made the announcement public, he will not return to Consortium for his junior season. Towards the end of a video interview with reporter Blair Glover on 1Nation’s youtube Tv account, the question was posed to the 6’7″ Jackson, “Will you be at Consortium for the 2014-2015 school year?” After taking a deep breath, Jackson responded, “I will not be at Consortium. I will be out in California.” Following the word California, a blank screen popped up with the words “Stay Tuned.” Leaving many questions unanswered to the basketball community within Michigan. The decision for Jackson comes after a sophomore seasons in which he averaged 28 points and 15 rebounds a game for his Consortium Cougars, a charter school located on Detroit’s Westside, leading them to a Class C state championship. He solidified himself not only as Michigan’s top player, but one of the premier players in the whole country. Rivals.com in their national class of 2016 rankings lists Jackson as the number one player in the class, while ESPN tabs Jackson for second, only behind a seven foot center from Virginia. California is in fact home for Jackson. He was born in San Diego, as he pointed out in the interview, while his mother was trying out for the WNBA for the league’s inaugural season. Now which school Josh will finish his high school career, is the million dollar question. California is home to some of the most prestigious schools when it comes to producing basketball talent. Schools such as Mater Dei and Archbishop Mitty have their fair of distinguished alumni in the basketball profession. And while they might be in the running, Josh thus far has not named any particular schools that would be likely destinations, but with the Summer nearing the halfway mark, a decision will likely be made soon in order to signup for Fall classes at his next school. Josh has dazzled and awed Southeast Michigan for two years now, and while many will miss his spectacular performances on the hardwood during Winter time, Jackson will be entering into a new chapter of his life. One which many can agree is full of promise.